BONOBO LAND: Lies, Damn Lies And Statistics In Sweden (of all places). Lies, Damn Lies And Statistics In Sweden (of all places). This post is basically a follow-up to my earlier Just What Is Going On In Sweden? one, and has been stimulated by an article which appeared in Bloomberg earlier in the week, detailing a number of issues which have arisen in conjunction with the Swedish Statistical Office. Basically, most of us were, I imagine, pretty shocked to learn at the start of March that Sweden had unexpectedly fallen back into recession in the fourth quarter of last year: we were shocked not only because the news in itself was bad, but also because we had been under the impression that the Swedish economy was recovering nicely. 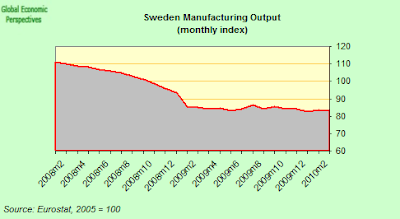 Yet despite all our prior expectations the Swedish statistical office reported that gross domestic product contracted by a seasonally adjusted 0.6 per cent in the fourth quarter of 2009 (when compared with the previous three months), while, in addition, the third-quarter figure was revised to a 0.1 per cent quarterly decline (down from an original 0.2 per cent gain). And two consecutive quarters of contraction meant that, technically speaking, Sweden was well and truly back in recession. 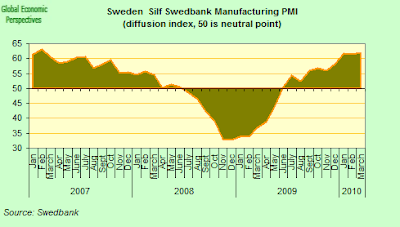 But there was more, since if those of us who had been following the performance of the Swedish economy were more astonished than surprised, it was because the Silf Swedbank manufacturing Purchasing Managers Index had been showing not only robust growth for Sweden's industrial sector, but even suggesting it had been experiencing one of the fastest rates of expansion on the entire planet (and for several consecutive months, see chart below). And just to show that concerns about the kind of data we have been seeing out of Sweden of late are not unfounded, we have the case of what Cecilia Skingsley, head of macro research Swedbank calls the "shoe adventure". Basically, and as Bloomberg reports, when the Riksbank raised interest rates in September 2008, 11 days before Lehman Brothers collapsed, Sweden's central bankers based their decision on inflation figures from the Statistics Office. Unfortunately, later that month four months of inflation data had to be corrected after the Office discovered that a computer inaccurately calculated a 28 percent increase in shoe prices (although the problem, I imagine, lay with the person who entered the data, rather than a malfunctioning computer). As Cecilia Skingsley points out, apart from the impact on central bank monetary policy, “The shoe adventure meant we ended up with a different price base amount, which in turn affected benefit payouts.” In fact Bloomberg estimate that the mistake cost the government something over 600 million kronor ($84 million) in excess benefit payouts. Statistics Sweden boasts a proud career which dates all the way back to 1686, when a church law became the basis for the Swedish population census. It released 74 publications last year and 371 press releases, cataloging everything from how many moose are shot annually, to the number of Swedes that are named after a Christmas tree ornament. But for all its venerable history, the office (which employs 1400 people) has evidently seen better days, since over 10 percent of 71 statistical reports published in February and March were corrections of earlier data releases. And it isn't only the inflation and GDP data which has been causing problems, Figures for local government finances were corrected last month to a deficit of 2.2 billion kronor from a surplus of 2.4 billion kronor. 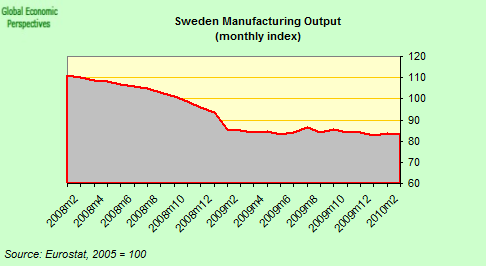 The Swedish government uses these figures to draw up its annual budget. Another area of contention revolves around central bank rates and home mortgages. The Statistics Office had to correct on Feb. 25 its estimate for the proportion of Swedish households with adjustable-rate mortgages, revising the time series as far back as far as September 2005. The figure for December was adjusted to 58 percent from 48 percent. The revision prompted speculation the Riksbank may have forecast higher-than-necessary interest rates at its February 10 meeting. 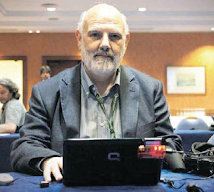 All these issues are rather serious, even if some are more important than others, and certainly go to show that statistical issues in Europe extend well beyond those we have seen in the recent highly publicised Greek case. Bloomberg cite many analysts who are rightly angry about the current state of affairs, but let me add my own personal beef about Swedish statistics here: the lamentable state of the SILF Swedbank PMI readings has lead me to suspend Sweden from my monthly global manufacturing report. Quite frankly this sort of faulty measurement only fuels the (largely unjustified) scepticism which tends to surround this kind of qualitative performance measure, yet from what I can see Markit Economics country reports are, by and large, reliable within a reasonable margin of error. Which only makes the Swedish case stand out further, and makes it, at least for my part, incomprehensible that Swedbank haven't felt the need to make some sort of correction/statement on the topic. Is Estonia's Euro Membership A Done Deal?